The three figures form a sort of mystic circle and they seem to say to us: “May you all be one as we are one.” (cf John 17: 21). 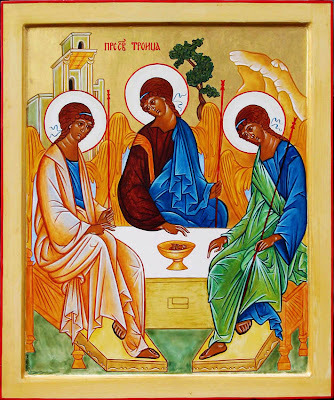 The communion of the Holy Trinity is lived out in prayer, above all in the Eucharist. (Revd Canon Professor) Patrick Comerford is Lecturer in Anglicanism, Liturgy and Church History, the Church of Ireland Theological Institute. This Bible study was part of a lecture/seminar on 12 October 2015 as part of the MTh module TH 8824: Liturgy, Worship and Spirituality.